The Hawaii Winter Outlaw Seires - BBQ and Safety Session. 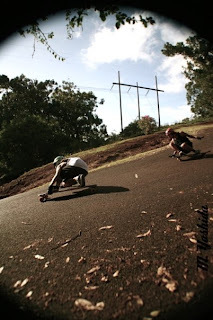 The Hawaii Winter Outlaw Series is getting closer with the first race a little over a month away and its looking like its going to be GOOOOOOD! So far we have received sponsorships from Rip City Skate, Caliber Trucks, Blood Orange, Fireball Wheels, 808 Skate, Loaded, Orangatang and more to help stoke out the racers at each event. We will be having a BBQ/SafetySession/SlideJam on Saturday, August 13. Noon @ The Loop. Here riders will get a chance to meet all the skaters from other parts of the island. We will also be making sure that everyone has the skills needed to race safely. If any riders are feeling uncomfortable and want some help... there will be tons of rippers around to team up with to talk to and learn from. If you live on Oahu and plan on entering the series... PLEASE MAKE IT TO THIS BBQ. This will also be the first chance to start getting in your early registrations. It will save you money and get you bonus prizes! Keep spreading the stoke of the series. Lets make it a good winter for us and all of the visiting skaters that will be coming. Hope to see everyone at the BBQ. This year we have a early registration special available. Reserve a spot by emailing StokedSkaters@aol.com or signing up on WheelTurnerHawaii.com and pay your full series entry of $90 by September 17. By doing this you will save $10 on entry fees and get a series schwag bag… you will be stoked! If you choose not to do this, please have your name registered ( no payment needed to register name, pay day of event ) for each race three days before the event or it will be a $5 late fee on top of the entry fee. Team Towns Too Far wins the Summer Series event 1! Yesterday was the first event of the Moonlight Summer Series. It was a team scavenger hunt at the University of Hawaii and did not take place in the moonlight. hah. We all met up at 2pm at yogurtland to get our hunt lists. There were 28 things to try to get done in 1 hour... everything from finding a Hawaiian Kane Dolo statue to getting a girls name and number. The teams of four started skating around and searching hard for the check points. After a hour of lurking UH campus all of the teams finished up at a local community park to get the results. The points were added up and there was a tie! A team of townies and out team! A tie breaker was needed so we decided on a team relay push race around the park. In the end it was a team of Bronson S, Maika M, Pono C, and me taking the win! Team Town's Too Far made the swoop! We were stoked to receive a box of goodies ( gloves, shirts, pucks, stickers, nuggie nuggies, blunt wraps, beer coozies and more ) from the sponsors and we celebrated with a winning blunt right away. Big Mahalo to Kenny B and all of the sponsors for making this possible... Cant wait for the next event!